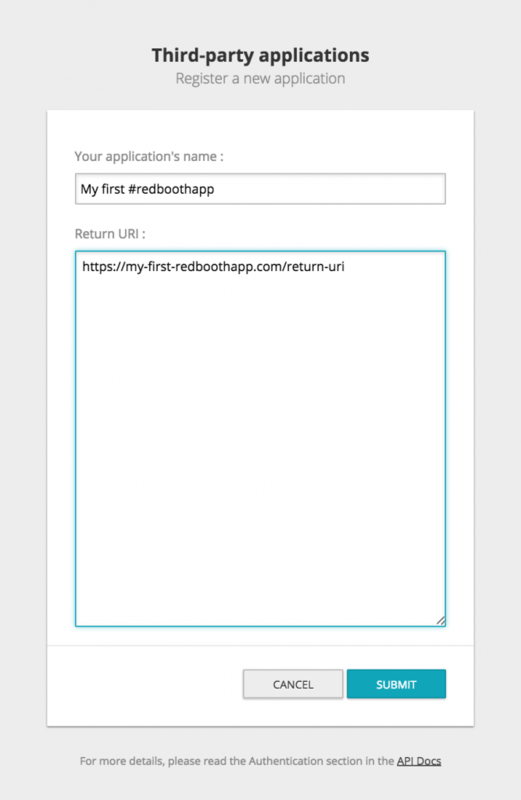 Apps connect to Redbooth via OAuth2, an open standard followed by most last generation APIs to authenticate and authorise external apps. 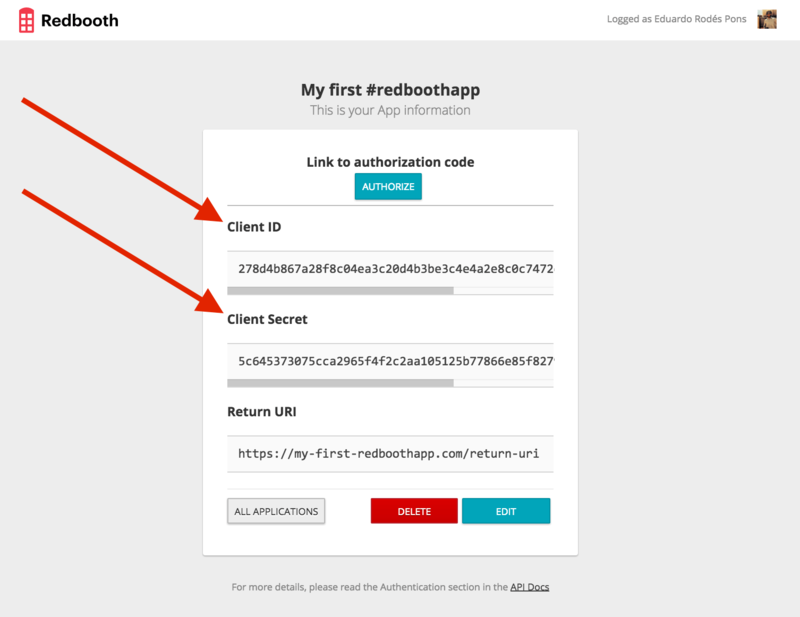 The following walkthrough will show you how to register an app in Redbooth; how to get the authorisation from a user to retrieve private information from his Redbooth account and how to get an Access Token and a Refresh Token. Start making API calls in three easy steps! Return URI or Callback URL: The redirect URI is the URL within your application that will receive the OAuth2 credentials. B) Make a note of both your Api Key and App secret. If this is your first time using OAuth2, we recommend you to take a look at the following article: http://oauth.net/about/. On the other hand, with Runscope’s Oauth2 Tool you will be able to get your Access Token and Refresh Token fast and easily, in an interactive way. Whether the endpoint returns an Authorization Code. For web applications, a value of code should be used. For browser-based apps or mobile apps token should be used. More information here. Redbooth will redirect the user back to the url specified in redirect_uri returning an Authorization Code. The redirect_uri must have the same hostname and path as the callback url specified in your app settings. 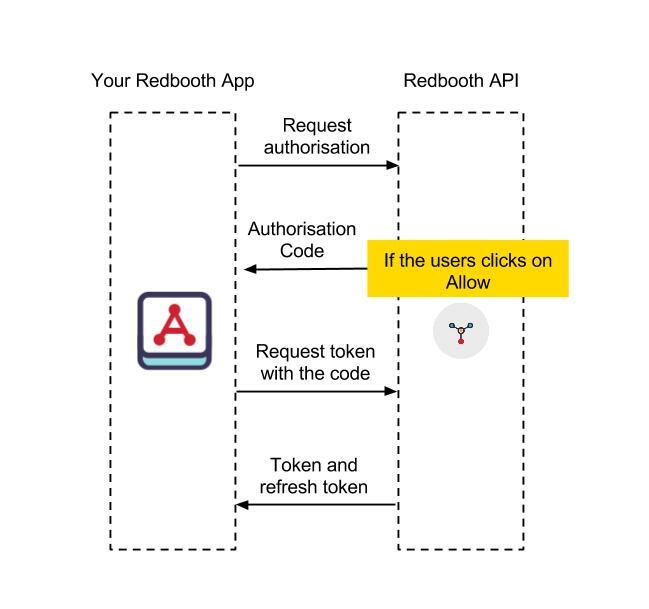 Once your application has completed the above section and gotten an Authorization Code, it’ll now need to exchange the Authorization Code for an Access Token from Redbooth. That Access Token will come with a Refresh Token that you will have to store in your app in order to refresh the Access Token when it expires. Each Access Token comes with its unique Refresh Token. NOTE: Tokens expire every 7200 seconds, two hours. Your Access Token will always expire after 7200 seconds (2 hours), that’s why it is extremely important to always keep the Refresh Token that Redbooth sends with each Access Token in your app. With that Refresh Token, you will be able to get a new Access Token and its corresponding Refresh Token. < Status: 401 Unauthorized < WWW-Authenticate: Bearer realm="Doorkeeper", error="invalid_token", error_description="The access token expired"
< WWW-Authenticate: Bearer realm="Doorkeeper", error="invalid_token", error_description="The access token expired"
NOTE: Take into account that you will have to update the stored Refresh Token every time you ask for a new Access Token, since each Access Token has his unique Refresh Token. If you’re planning to work with Ruby, Redbooth’s Official Ruby Gem will make your life easier! Check how we deal with the authentication process in GitHub.